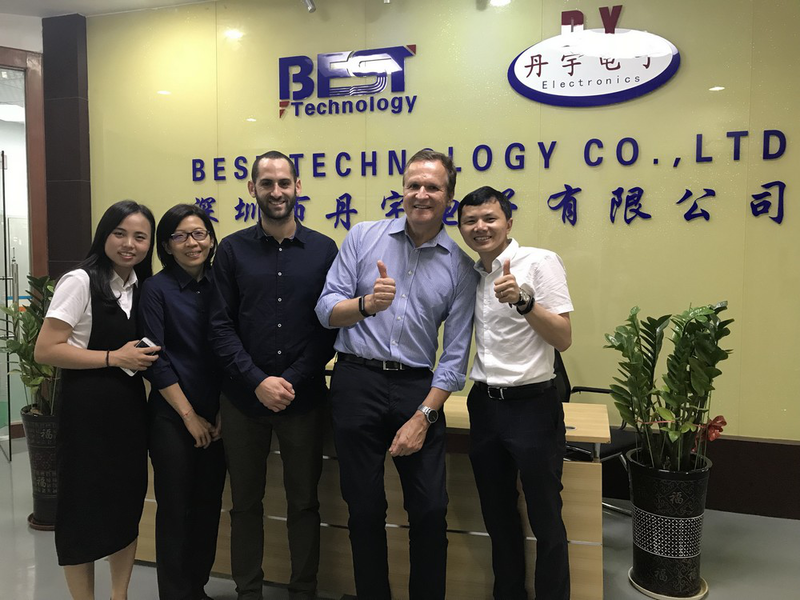 In the morning of April 24th, 2018, our customer from Israel visited our company. They are very nice and easygoing. 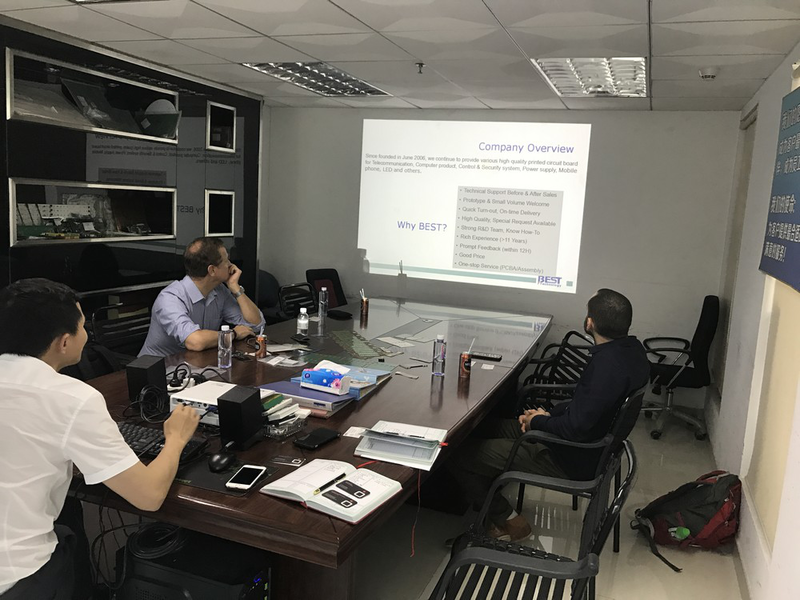 Firstly we had a short meeting in our office to discuss some PCBA projects and component, also we invite them to see our company’s video, which they know more about our capability on PCB, Rigid-flex circuit, FPC, metal core PCB, Ceramic PCB and lead time for different circuit boards. After that, we moved to our SMT plant, where is only 15 minutes far from our office. 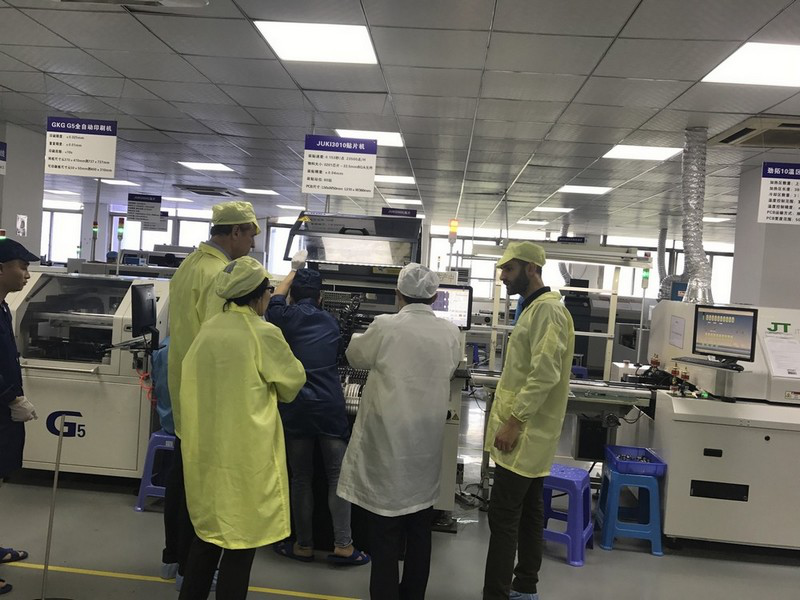 In our PCB Assembly plant, we show customers PCBA (SMT) process: First put PCB on Auto-loading machine, then transfer to Auto-Solder-paste-printer, after than go to the next step of components pick & place by SMT machine, after visual checking, board will go throw to reflow oven, QC will check each piece of board after reflowing and then do function testing, or move to AOI process to make sure all components are on the correct position and direction, as well as X-ray testing for the boards with BGA. 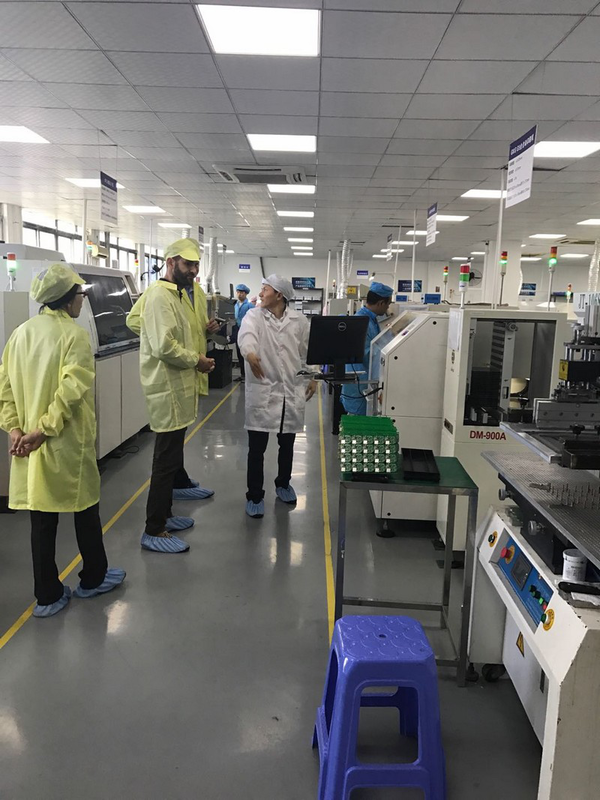 Each step was monitor and operators are following up with the SOP, to make sure quality is always controlled, and customer are interesting in how we test the assembly boards using testing fixture. Customer is very happy with our SMT procedure and become more confident in placing more circuit board and PCBA order with Best Technology. After the meeting, we have a quick but delicious Chinese lunch together. And we will visit that customer in the end of May and believe by that time, we can do more things together, as well as good memories with each other. Appreciate again for their valuable time to visit us, that’s our great pleasure to have that forenoon with them. Look forward seeing them again in Israel in the end of May. 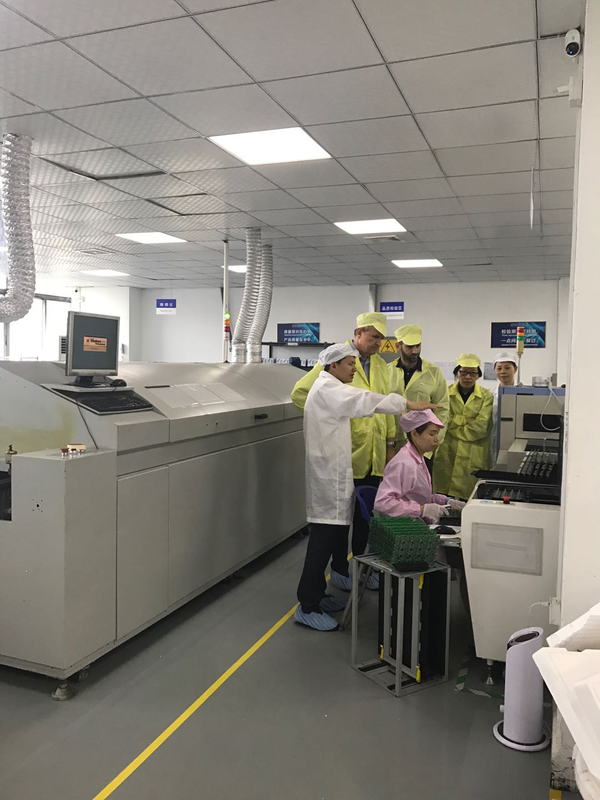 We always welcome customer to visit us, so that they can know about what we can make, not only providing various types of printed circuit board, but also always supporting customer best service with good price. In order to improve the working efficient of management team and staffs, Best Technology provide《The seven habits of highly effective people》to each staff; This book can inspire you in working, life, management, family and your future development; Best Tech sales team has learned how to improve themselves and realized their sales target with good habits. 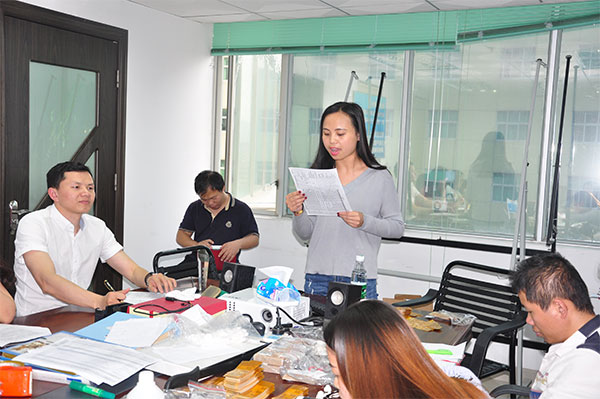 PCB sales girl said that there is still a lot of things need to be improved. We should apply the knowledge what we learn to practice. In Best Technology, we had a series products such as: Metal Core PCB ( MCPCB) 、 Aluminum PCB, COB MCPCB, Copper PCB, Ceramic PCB, heavy copper board , HDI(1+N+1, 2+N+2, 3+N+3), Rigid-flex circuits, high TG, HDI, high frequency (Rogers, Taconic), impedance controlled board, PCBA (SMT), our sales girls talked about how to supply most suitable product and best service to customer, we should communicate with customer effective and know their demand. 2, In order to achieve excellent team job, we need to listen and understand the different opinion from our team members; also when handle different customers, we should respect different habits, culture background from different customers, and solve their problem effectively. 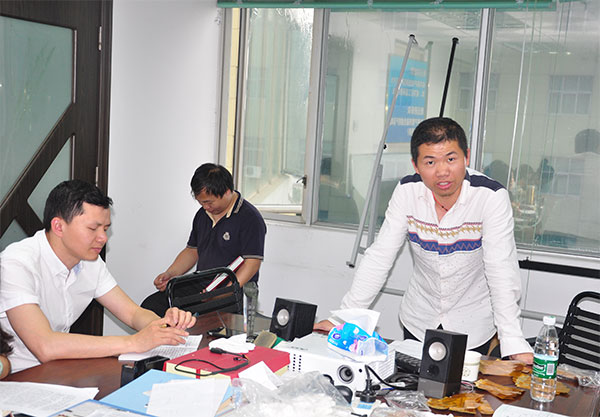 3, Company’s goal: Becoming the special and best PCB partner in Shenzhen area in 2020. Let’s keep our target in our mind and try to realize it. Good habits can help you a lot and also provide customer’s best service, to achieve the final win-win. Engineering department is sharing his report. Learn more, practice more, and improve efficient. Be successful in your future. 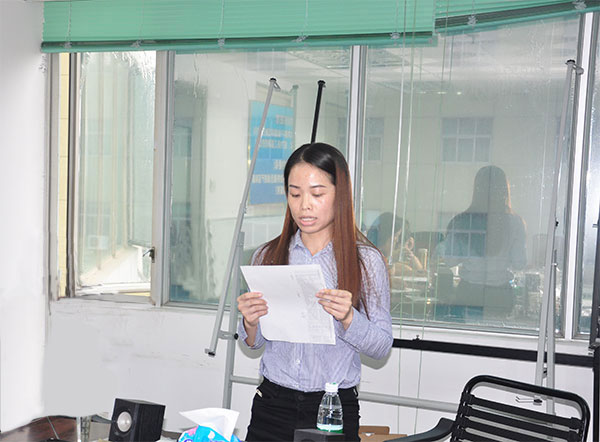 More sharing from Metal dome sales, FPC sales, Marketing department, warehouse, Human resource department, Finical department, QC..
After sharing, all the employee had more feeling on these 7 habits and know how to improve themselves in future. We will always on the way to become the most reliable partner of customer and the most satisfactory company of employee. Welcome to contact us to try our printed circuit board and metal dome industry. You are currently browsing the PCB & MCPCB - Best Technology blog archives for April, 2018.